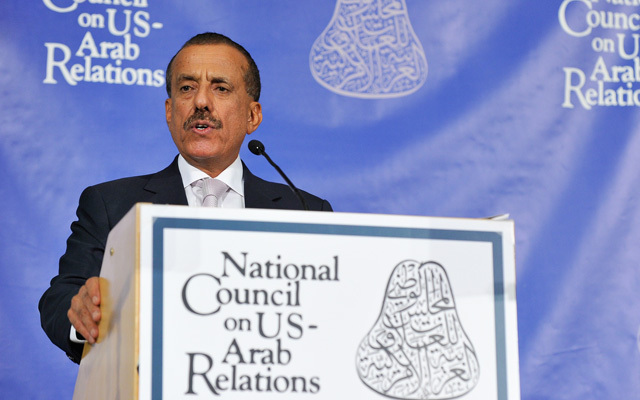 I would like to start by thanking the National Council on US-Arab Relations, led by Dr. John Duke Anthony – Founding President and CEO, for inviting me to speak at the ‘24th Annual Arab-US Policymakers’ Conference’. I thank you for having me! According to IHS’ annual Global Defence Trade Report, in 2014 Saudi Arabia became the largest worldwide importer of defense equipment as well as the largest defense market for the United States. 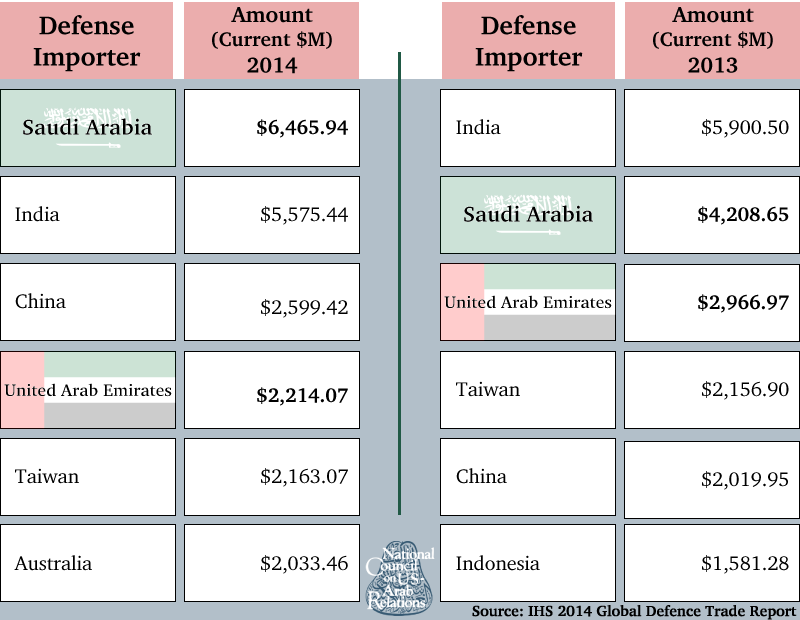 Saudi Arabia replaced India as the largest defense importer in 2014 after being the second largest defense importer in 2013. Saudi Arabia’s defense imports increased by 54% from 2013 to 2014. According to the same report, the United Arab Emirates (UAE) was the world’s fourth largest defense importer in 2014 and third largest in 2013. Combined, Saudi Arabia and the UAE imported $8.6 billion in defense systems in 2014, which is more than the imports of all of Western Europe combined. The U.S. was the largest beneficiary of the increases in the Middle Eastern market, with defense systems exports to the region growing from $6 billion in 2013 to $8.4 billion in 2014. Other leading defense exporters to the Middle East in 2014 were the United Kingdom ($1.9 billion), Russian Federation ($1.5 billion), France, ($1.3 billion), and Germany ($1 billion). According to data on international arms transfers published by Stockholm International Peace Research Institute (SIPRI) on March 16, 2015, U.S. exports of major weapons increased by 23% between 2005-2009 and 2010-2014, and account for approximately a third of international arms exports. The Middle East was the recipient of 32% of U.S. weapons exports and the U.S. accounted for 47% of total arms supplies to the Middle East from 2010-2014. According to SIPRI, Saudi Arabia increased the volume of its arms imports by 417% between 2005-2009 and 2010-2014. 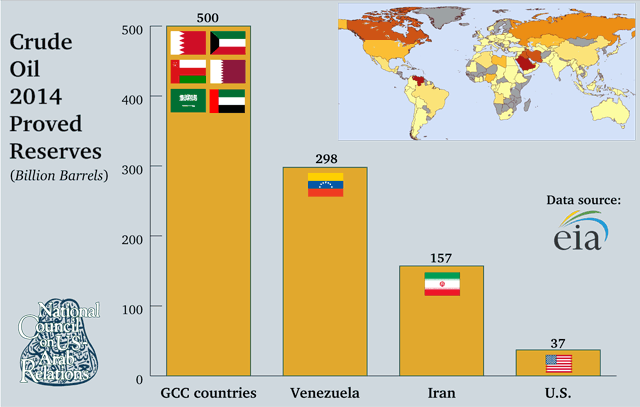 Imports of arms to the Gulf Cooperation Council countries – Bahrain, Kuwait, Oman, Qatar, Saudi Arabia, and the UAE – accounted for 54% of imports to the Middle East from 2010-2014. The National Council on U.S.-Arab Relations, in coordination with the Emirates Center for Strategic Studies and Research in Abu Dhabi, escorted a delegation of students from the National Intelligence University on a study visit to the UAE in April 2013, coinciding with the Emirates Center’s 18th Annual Conference on “The Future of Warfare in the 21st Century.” The visit provided the students with an opportunity to explore the dynamics of some of the major economic, political, and social determinants of UAE culture as well as the country’s modernization and development. 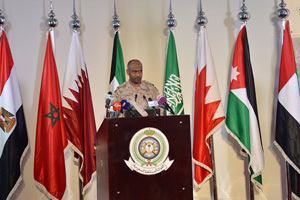 The National Council on U.S.-Arab Relations, in coordination with the Emirates Center for Strategic Studies and Research (ECSSR), organized and led a May 11-20, 2012 study visit to the United Arab Emirates for the United States Naval Academy (USNA) in Annapolis, Maryland. The Academy’s delegation was comprised of twelve Midshipmen and two faculty members. The visit provided the Midshipmen an opportunity to explore the dynamics of some of the major economic, political, and social determinants of UAE culture as well as the country’s modernization and development. The National Council on U.S.-Arab Relations, in coordination with the Emirates Center for Strategic Studies and Research in Abu Dhabi, escorted a delegation of cadets from the United States Air Force Academy on a study visit to the UAE in November 2012. The visit provided the cadets with an opportunity to explore the dynamics of some of the major economic, political, and social determinants of UAE culture as well as the country’s modernization and development.